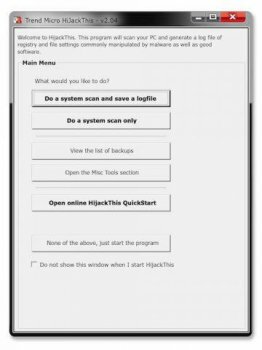 HijackThis is a general homepage hijackers detector and remover. It scans for all objects which may be affiliated with Web Browser activity. StartList scans the system for all objects that are in all startup sections of the registry. It is continually updated to detect and remove new hijacks. It does not target specific programs/URLs, just the methods used by hijackers to force you onto their sites. Update, found change log, why they cant post it here is beyond me..
An excellent program, very useful in the right hands, very dangerous in the wrong hands. Note that is not a criticism of the program. There really is no way to make a program that's powerful and yet safe for novices, other than asking 'are you sure ?' on every mouse click - and that still doesn't make it safe against the ones who will ignore the warnings. The best thing a novice can do is admit they only know so much and get someone who knows more than they do. Powerful and useful, but you must really know what you are doing. "It used to remove nasty spyware, but it is VERY dangerous! " So they have to make the software securefull for new users. So should be used only by people who know what they doing.Think about people who dont know what they are doing. Make it more understanble for who are new. And put many languages in it. One of the best PC forensic tools on the market. This does more than just scan startup locations. it displays in detail all browser-helper objects (BHO) which are the source of most scumware, drive-by installs and annoying browser toolbars. It displays any changes to your browser's home page, start page and search and allows you to restore to original values. It also displays any non-microsoft services that run at startup as some parasites install themselves this way. It also creates a backup of any changes so you can undo them if removed accidentally. I don't know how 793K could be considered bloatware as there are similar utilities out there that are 10 times the size that do less. I agree with uzi this is defintely not for novices but has helped me in the past in identifying and removing crudware where Spybot S&D, Spyware Terminator, AVG and others have failed. A very useful and powerful tool, but novice users should practice caution and get help from power users. The automatic assistance service by Trendmicro is still not as useful as the one by hijackthis.de, and even the one by hijackthis.de does not suffice. Nevertheless, it is a powerful tool. I always found this to be a near-useless, buggy, overrated, simple utility. Oh wow, it scans startup locations. Why the hell would Trend Micro pay for this? for the moron that said Mcafee found a virus you probably have one from using Mcafees. A good trustable tool kidnapped by money-hungry wolves ? NO, thanks !